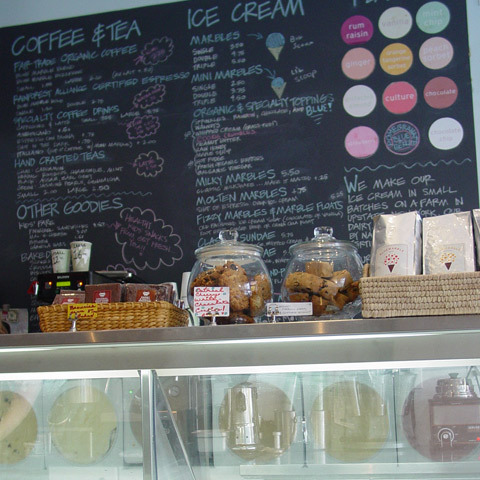 “Spread the Love” with Blue Marble in Prospect Heights and their delicious assortment of farm fresh organic ice cream, organic fair-trade coffee, hand crafted teas, and natural baked goods. You can even take home freshly packed ice cream in pint size containers! 2 & 3 trains, exit Grand Army Plaza (North): walk up Plaza Street East, around the park; pass Flatbush Avenue, then Vanderbilt Avenue until you come to Butler ; make a right onto Butler Street to Sterling Place; make a right on Sterling Place to Underhill Avenue; walk 1/3 block (right) down Underhill Avenue. This second location of Blue Marble opened up in May 2008 in a space shared with New York City Explorers, a center for family enrichment. In tune with its ecologically and socially conscious Atlantic Avenue location: http://ztrend.com/brooklyn/boerum-hill/social/203/blue-marble-boerum-hill , the ice cream parlor offers its signature organic, handmade scoops of dreamy goodness, along with coffee drinks, teas, and baked goods. In its Prospect Heights location, it serves as an added component to the family center. Blue Marble’s use of green serveware, green energy and green building materials has children and adults alike asking questions, and understanding better how small changes in the businesses we support and the things we consume can affect change across the globe. Most importantly, all of it-the ice cream, the education-is fun. Take the kids, take yourself. Let your preconceptions go. Between a scoop of Concientious Chip and a Hot Fudge Latte, you’re bound to experience bliss.